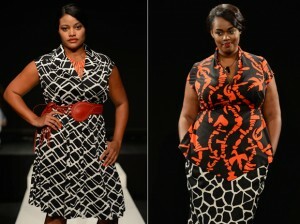 Plus-size models finally walk the runway at New York Fashion Week. It’s about time! Considering the average North American woman has worn a size 14 for many years now, it’s perplexing as to why fashion houses still resist sending plus-size fashions down the runway. Yes, the fashion industry is known for being superficial and consistently argue that clothing only looks “right” on super thin models. However, if one considers the issue strictly from a bottom line perspective, it’s just plain bad business sense to sideline a huge portion of the population who does not wear a size 2! Guess what, fashion designers – women who are bigger than a size 2 or even a size 12 have fashion sense, too, want to spend their money, too, and want to see their body type reflected on the runway, too! Finally, someone has come to their senses and woken up to the aforementioned facts. On September 6, 2013, Cabiria designer Eden Miller presented her plus-size Spring 2014 collection alongside five other handpicked designers as part of the Fashion Law Institute presentation at Lincoln Center. Models Frances Cordova and Victoria Lee, pictured above, ended a 60 year drought of bigger bodied women on the New York catwalks and they looked utterly fantastic!